The Art Museum of the Hat in Ghiffa owes its fame to its uniqueness. 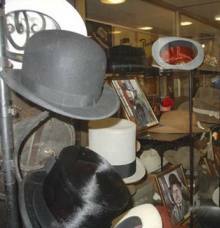 The museum is located in some of the halls of glorious, former hat manufacturer Cappellificio Panizza, which after a century of wonderful business, closed in 1981. After the hat manufacturer closed, several very enthusiastic hat makers thought they could take advantage of the heritage in the factory. In agreement with the family of the last administrator, they collected the various machines, many hats and other samples in the old factory and organised them, thus creating this very unique museum in 1992. The Art Museum of the Hat is grouped into two halls. The first one uses images and old tools to illustrate the entire process of felting. The second hall uses various machinery (blocking machine, crown press, polisher) to document the next steps in processing and finishing the hat - what was once Cappellificio Panizza’s main work. At the end of the journey is a beautiful exhibit with advertising material and several models, which document the evolution of style, fashion and tastes with the passing of time. Admission is free and tours are guided.